Turn the oven to broil. Defrost and drain the chopped spinach well. Also drain the artichoke hearts. In a bowl empty the Double Cheddar bottle. Add 1 Cup of the shredded mozzarella cheese, the spinach and the artichoke hearts. Mix well together. Put it in the microwave for 2 minutes on high. Stir and put it back for another two minutes. Pour the cheesy mixture into a baking dish and sprinkle the top with the remaining cup of mozzarella cheese or any other cheese of your choice. Broil until the cheese is melted and golden brown. Serve right away with your favorite tortilla chips or crackers. You can find the Cheesy Ragú Double Cheddar on the Spagutti Sauce isle. Tip: Cut the artichoke hearts to a desire size. You are going to love how delicious and easy this recipe is. I love spinach artichoke dip. This one does sound super easy! I want some right now! I’m visiting you today from eighteen25. Your site is full of amazing ideas! My weekly linky party–One Creative Weekend–has gone spooky this week in honor of my thirteenth party. If you haven’t already, I hope you’ll visit “One Creative Weekend” on OneCreativeMommy.com (open every Fri-Wed) and link up this idea and anything else you’d like to share. (You can include non-Halloween posts as well, but feel free to link up as many Halloween-themed posts as you like.) There are two categories—one for Halloween and one for everything else. OMG!!! So delicious, and so simple to make. Love it!!! 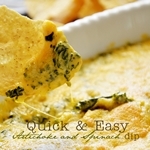 This is also a friend’s favorite dips too, so I’ve passed it on to her too! I love artichoke dip! This looks so cheesy and delish! This sounds like the perfect addition to our weekend football menu. This sounds delicioso, gonna try it this weekend!! It is so easy to make. We love it!